The three masters of the Viennese Classic, Joseph Haydn, Wolfgang Amadeus Mozart and Ludwig van Beethoven are celebrated as national heroes in Austria. You will come across the composers pretty much anywhere you go, and be it at a local souvenir store. You should know at least the basics of their biographies; however, since there is so much excellent material available online and offline, I thought it would be sufficient to provide only overviews on their biographies. For those of you who have a deeper interest, I collected some relevant links in order to refer you to more extensive sources. The oldest of the three composers of the Viennese Classic was born as Franz Joseph Haydn in Rohrau in Lower Austria in 1732. He was the second-born child of 12, though only six of the litter survived. His not-quite-as-famous brother Johann Michael was born five years later. 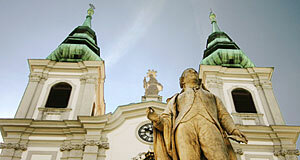 In 1738, Joseph moves to Hainburg near Vienna, where he takes lessons in music from a relative. Between 1740 and 1749, he is a choir boy in St. Stephan's Cathedral in Vienna. During this time, he receives a thorough musical training and starts to compose. Between 1753 and 1757, he takes further lessons from Nicola Porpora and his formal education in finished. He gets his first commissions as a composer by Baron Joseph of Fürnberg. In 1759, Haydn becomes the chair musician of Count Karl Morzin in Lukavec. A big move for Haydn follows in 1761, when he becomes the second chair musician at the court of the Princes of Esterhazy in Eisenstadt. In the Burgenland, Haydn spends productive years and develops a distinct style for violin orchestras. In 1766, he becomes the first chair musician and composes symphonies, opera, services, violin quartets and sonatas. Haydn doesn't like the Esterhazy castles of the Burgenland very much for their remoteness, but turns into a highly productive composer. In 1785, he visits Mozart in Vienna and makes friends with him. By this time, Joseph Haydn is already internationally well-known. In 1790, Prince Nikolaus Joseph Esterhazy dies and the court orchestra is dissolved. Nonetheless, Joseph Haydn is still granted his position as the chair musician and moves to Vienna. There he writes symphonies and between 1790 and 1792, tours England. There he receives an honorary doctorate from Oxford. In 1792, he returns to Vienna, where he continues to compose and teach. One of his students is Ludwig van Beethoven, although they never become particularly close (Beethoven is simply one student of many). In 1794, Haydn tours England for the second time. In the following years, he composes "Gott erhalte Franz den Kaiser", the "Creation" and the "Jahreszeiten". In 1800, his wife dies. By this time, Haydn is the most senior composer of Vienna, receives many honorary awards and is highly respected. In 1809, Napoleonic troops occupy Vienna. A French officer performs in front of Haydn. Two weeks later, Haydn dies on the 31st of May. He is first buried in Vienna, but his body apart from the skull is later transferred to Eisenstadt in 1820. In 1932, Prince Dr Paul Esterhazy builds a Mausoleum for Haydn. However, only in 1954 the skull is finally released in Vienna and buried in the Mausoleum where it still is.